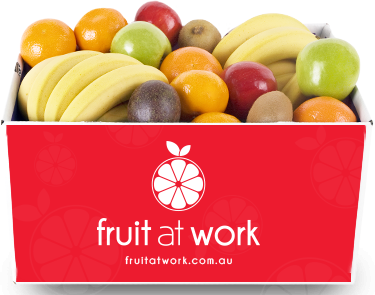 Fruit at Work is Australia’s #1 fruit supplier and resource for eating healthily in the workplace. Our most popular product, consisting of a premium selection of Australia's finest fruit. Unmatched A-Grade premium quality fruit. An abundance of favourites including bananas, oranges, apples, kiwi fruit and pears. Gorgeous seasonal additions such as nectarines, peaches, plums, mandarins and passionfruit. Every delivery includes a surprise bonus such as grapes, a punnet of strawberries and sugar plums! An award-winning box with the most delicious fruit available. The perfect mix for a large busy corporate workplace. Delivered in a recyclable cardboard box. Discover why Fruit at Work is the premier choice and Australia’s most awarded workplace fruit delivery supplier. We regularly deliver Australia’s best, freshest and tastiest fruit to your office in perfect condition. Flexibility and choice - Choose your fruit box size, product mix and preferred pricing option. All business sizes - From a home office to 5,000+ employees. 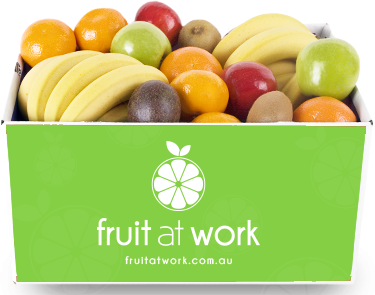 Customised corporate fruit profile - We provide the best fruit plan for your employees. Your budget, your needs - We’ll find the best office fruit delivery package to fit your budget. Volume pricing is available. Delivery options - Choose your delivery days, order splits and labelling requirements. At Fruit at Work, we believe in delivering fruit that employees lust over. The kind that makes people run to choose upon delivery. Enjoy a wide range of around nine different types of beautiful A-Grade fruit. You’ll always receive an abundance of office favourites! Expect many varieties of apples, juicy, pears, oranges and bananas to keep their energy levels up. We constantly add seasonal variety throughout the year. Your employees will love our incredible peaches, nectarines, mandarins, plums and grapes! Ready to eat fruit that is so fresh, it will last all week (provided it's not eaten first). We hand-select and consistently deliver top quality, satisfying medium to large fruit pieces. We choose the very finest seasonal produce we can buy on any given day, specifically selected to be eaten in your workplace. Your fruit arrives in perfect condition. It’s expertly packed in an Australian-made biodegradable and recyclable cardboard box, all within our fully certified facility. Want Milk or Cherries delivered with your Fruit at Work order? If you are a current Fruit at Work customer and would like to add a box of cherries or fresh milk to your regular delivery, just call our Customer Service Team on 1300 246 256 and they will arrange this for you. Our cherries come in a sturdy but elegant 2 kilo black box and are priced at between $35.00 and $45.00 depending on volume ordered*. If you are a Sydney customer, you can also have milk delivered with your order. Choose from Full cream, Skim or Soy milk in both 2L and 1L sizes. Cherries Direct – Lovingly and meticulously grown farm fresh cherries supplied directly to your door. For more information visit www.cherriesdirect.com.au. Milk at Work – The freshest cafe quality milk from award-winning Australian diaries to your workplace. For more information visit www.milkatwork.com.au. * Based on 2 pieces per person per week. Delivery free to metro areas and prices to single locations.